Hip hotel situated in a quiet street near Soho Square. The area is the heart of London\'s entertainment and creative community and is surrounded by some of London\'s best restaurants, bars, cafes, theatres and nightlife. There are 85 bedrooms and suites as well as 6 private apartments. All are individually designed in a contemporary English style. Bathrooms are luxuriously designed in granite and oak with walk-in showers, double basins and exclusive bath products by London perfumer Miller Harris. There are four fifth-floor penthouses with tree-lined terraces and views across London. There are several private rooms. The Swirl and Black & White Rooms are flexible in their format and can be easily transformed from a sumptuous private dining room to a corporate boardroom or luxurious drawing room. 2 sumptuous state-of-the-art screening rooms accommodating 45 and 100 guests respectively. They provide the latest technology in terms of sound and projection including the most advanced digital capabilities. Screening Room One is fitted with Xpand Active 3D technology. The deep, luxurious leather seating is by Poltona Frau. The screening rooms are situated adjacent to three of the hotel's private event rooms on the lower ground floor. The hotel has a spacious, fully equipped gym comprising various cardio-vascular machines, free weights and exercise mats. A fully qualified personal trainer is based on-site. In addition there are 2 beauty treatment rooms which offer a wide variety of treatments including full body massage, facial, manicure and pedicure. The hotel is situated in a quiet street between Dean and Wardour Streets in the heart of London’s entertainment neighbourhood. It is surrounded by some of London’s best restaurants and bars, vibrant cafes and most exciting theatre and nightlife. 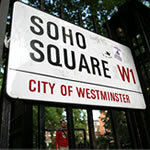 Leafy Soho Square is a one minute walk and the city’s business district is within easy reach by taxi or public transport. Plenty of shopping nearby, upscale can be found on Bond Street, Selfridges department store on Oxford Street, hi-tech can be found on the famous Tottenham Court Road. London has several airports to choose from. The two main international airports are Heathrow International in the west of London and Gatwick International south of London. The smaller airports mainly used by low cost airlines are Stanstead East of London and London Luton airport which is North of London. Finally there is a small airport in the city of London. It is possible to travel to any of these airports within approximately 60 - 90 mins using public transport. Travel times by car / taxi will depend on traffic and time of day. As London is very busy it is advisable to allow plenty of time to travel to and from the airport.